FR Shadecloth should be used in tensioned shade sails & structures in high volume areas such as shopping centres, tourist attractions, parks, restaurants, child care centres, car yards, schools, etc. 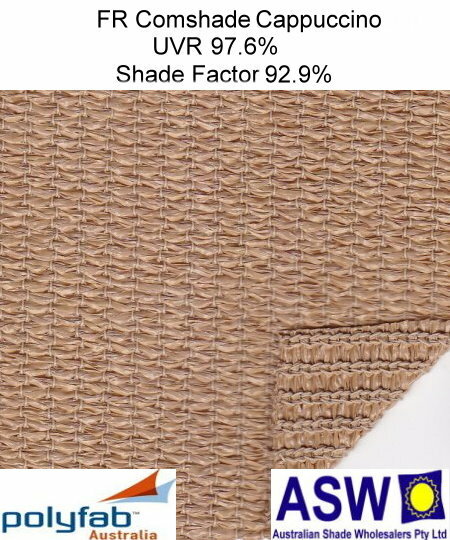 Architectural Commercial Shadecloth is primarily designed for use on Shade Sails and Tension Structures in both domestic, residential and commercial applications. Comshade is an innovative commercial, heavy duty knitted shadecloth designed for medium sized tension membrane shade structures where the shadecloth fabric is placed under greater loading strains. Comshade has less shrinkage and is more stable than other shade cloths, while maintaining high strength and over 90% UV protection. It is made from virgin resins and the best UV stabilizers which are lead and heavy metal free.